In this darkly comic view of the coming future, bureaucratic cog Sam Lowry dreams of escaping the totalitarian machine that society has become. He fantasizes about joining a beautiful woman flying through the clouds, far away from this world. One day he glimpses a female truck driver who resembles his fantasy and he attempts to win her love - but he ends up being dragged into the underworld of antigovernment terrorists and radicals. Terry Gilliam's vision, both expensive and expansive, resulted in a battle with studio executives over the lack of commercial potential of the darkly humorous, but often grim, material that was reedited for theatrical release without the director's approval. $30.099 thousand on 1 screen. Hype can be a terrible thing. How often have your expectations been built up by all of the hot advance word about a movie but it turned out to be less than scintillating? If you're like me, this probably happens pretty frequently. One example from the past: Brazil. 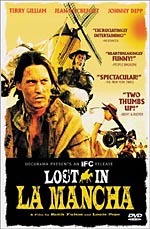 I rented that sucker on VHS back in the mid-1980s because it had received such great critical acclaim: best movie of 1985, proclaimed the Los Angeles Film Critics! When I watched it, however, I didn't think much of it. It seemed mildly interesting and entertaining, but nothing special. However, I eventually gave the movie another try, and my opinion changed to a radical degree. Brazil turns out to be a simply marvelous, dazzling movie that entertains and astonishes from start to finish. Short review? "Wow! What a flick!" Director Terry Gilliam creates a singular vision with this work. As with the best films, Brazil offers a fluid piece that leaves itself open to differing sorts of interpretation; your view of it may not much resemble mine, but neither is necessarily correct or wrong. That openness even extends to the movie's title; never is it made particularly clear why the film's called Brazil. My take on it? I think it partly has to do with the light fantasy nature of the song “Brazil” that's used throughout the movie. For one, the song offers counterpoint to the heaviness of the onscreen action, but it also reflects the fantasies of our protagonist, Sam Lowry (Jonathan Pryce). He dreams of a life away from the humdrum dullness of his world's bureaucratic reality, and the perky romance of the tune reflects that. I also couldn't help but think that the title reflects the fascism inherent in the film. This unnamed society is as fascistic as they get, and it seemed to me that it depicted some sort of alternate reality in which the Nazis won. Since South America was a noted haven for fleeing Nazis, Brazil the country makes sense from that point of view. Of course, it's never clear where the movie's supposed to take place, and I'm not saying that it's supposed to be in Brazil, but that's my opinion and I'm sticking to it! Even without that possible stretch, the fascist nature of this society is undeniable. The government is all-powerful, but not very well run, unfortunately. Not that anyone ever admits that, however. Mistakes are made, things break down, but the buck always gets passed; no one can actually recognize their flaws, for belief in a perfect system is absolute. In Brazil, paperwork is king, and nothing can occur without it. It's a government of the bureaucrats, for the bureaucrats; the people be damned. The whole story basically revolves around a paperwork mistake that no one will acknowledge, so lives are ruined due to governmental inefficiency. Brazil presents a quirky world but not in a gratuitous manner. I never felt that Gilliam added cheap jokes or silly sights just for their own sake; all of the humor and oddness seemed well-integrated into the film's world. That's an important point, for if you don't accept this environment as it is, you will have a much harder time connecting to the story. Gilliam can hammer viewers over the head with his points, but that's rarely the case in Brazil. As I mentioned earlier, much of the delight of the film stems from the fact that so much of it is open to interpretation. Key point: the government bases many of their restrictions on the idea that terrorists are constantly threatening the system and the safety of its citizens. However, it's never even vaguely obvious whether or not there are any terrorists. There might be, or the incidents may be the work of various layers of government agents who got lost in the system and aren't sure which side they're on anymore, or the destruction might just be more examples of things breaking down. Who knows? Not the viewer, and probably not even the government; it's so lost in its bureaucratic morass that it doesn't have the slightest clue what's really happening. On a similar note, one other merit of Brazil is that it's not in the least bit predictable. I rarely had much of an idea where it would go and what would happen next; it kept me guessing pretty much from start to finish. This is not to say that it’s jumbled or confused, though. On the contrary, I think it flows logically and sensibly, and I never felt lost or disoriented. The film maintains a strong pace and it keeps the viewer firmly involved and interested in its story. 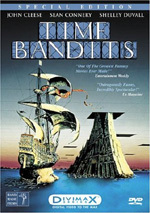 Although it had a relatively low budget, the production values of Brazil remain strong; I didn't think any of the effects appeared cheesy or phony, something that's not the case for Gilliam's previous film, Time Bandits. In addition to the wonderful production design and Gilliam's' solid direction, the acting really shines here. Jonathan Pryce nails his role as Sam. He manages to convey all of Sam's faults and contradictions without making him seem too weak; Sam comes across as a very accurate portrait of the kind of person he should be, given the circumstances. Pryce also shows that he's a terrific physical actor, especially when he offers comic bits like trying to eat a soggy piece of toast or hitting his head on the roof of his refrigerator; he's a constant delight to watch and he helps make Brazil special. As do the remainder of the stellar cast. Name-wise, Robert De Niro is the most prominent actor among the other actors as he performs a bit part as super-electrician Harry Tuttle. He's a treat, as he displays a comic spryness that lacks in his more serious roles. Really, it's hard for me to sort through the supporting actors and isolate any because they're all so good; almost everyone - down to Gilliam's daughter Holly as a three-year-old child of torturer Jack Lint (Michael Palin) – does well. If I had to find a weak link, it'd probably be Kim Greist as Jill, but that's mostly because of my own personal preference in women; Greist does a solid turn and is really very good, but I didn't find her to be good-looking enough to be a "dream girl." Objectively, however, she's just fine in the part. At the risk of sounding too exuberant, discovering Brazil made me feel like I'd found some sort of lost treasure. This is a film that can be watched and rewatched and retain most of its appeal; additional viewings are sure to reveal hidden nuances. Brazil is the sort of movie that you tout to all your friends, and which you then scream at them if they didn't also think it was brilliant. It's a masterpiece, plain and simple. Brazil appears in an aspect ratio of approximately 1.78:1 on this Blu-ray Disc. Though the image was held back by the source photography, it looked good within those parameters. Brazil usually went with a pretty subdued gray palette, but it managed to come to life with sporadic frequency. When it did so, the colors looked good. They were always concise and accurate, and they showed quite nice breadth. Blacks appeared deep and firm, while shadows were clear and well-developed. All in all, I felt pleased by this transfer. I thought the DTS-HD MA 2.0 audio of Brazil worked fine for its age. The soundfield opened up matters to a positive degree. The forward channels dominated as they depicted good stereo music and a nice sense of life to the various settings. Elements meshed together well and moved smoothly. Dialogue occasionally bled from the center to the sides, but that wasn’t a big concern. For the most part, the surrounds reinforced the forward speakers. They did so well, as they brought out a good feeling for the environments. They occasionally added a little more than that; some of the busier sequences seemed pretty involving. I wouldn’t call this an especially active mix, but it was above average in that regard given the age of the film. Audio quality was a little erratic, though not terribly so. Speech could seem a little thin and distant, but the lines lacked much edginess and were always intelligible. Effects fell into a similar tone. They could appear slightly rough and harsh at times, but they usually sounded reasonably accurate and full. Actually, bass response was pretty good, and that went for the music as well. The score varied between quite rich and somewhat wan, but the music was usually positive and lively. I wouldn’t call this a terrific mix, but it was more than satisfactory. How does the Blu-ray compare to the 2006 remastered DVD? Audio was fairly comparable; the DTS-HD mix had a bit more range but was still held back by the restrictions of the original material. The same went for the visuals – to some degree, Brazil will always be “silk purse/sow’s ear” territory, as it’s simply not the world’s most attractive presentation. In addition, the Blu-ray’s extra resolution revealed flaws not apparent on SD-DVD, as the softness of various shots became more obvious here. That said, it still offered obvious improvements, as the Blu-ray demonstrated superior colors and clarity. 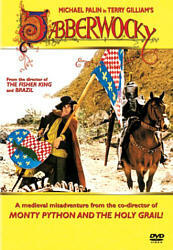 On Disc One, the "Final" cut of the film provides an audio commentary from director Terry Gilliam. He covers… well, pretty much everything. Gilliam discusses themes, inspirations and influences, sets, costumes and props, locations and the movie’s look, visual effects and cinematography, changes among the various versions and permutations of the script, cast and performances, and a host of other useful topics. The only minor negative I can attach to the commentary comes from Gilliam’s ego, since he can come across as a bit full of himself at times. Nonetheless, I don’t see this as an issue, especially since he proves so informative and engaging. Gilliam gives us an excellent snapshot of the production in this lively and rich commentary. Disc Two gives us the infamous ”Love Conquers All” Version of Brazil. Basic history: the folks at Universal weren't too keen on the edition of the film Gilliam initially handed to them, and they wanted cuts. Gilliam refused, and a battle ensued. 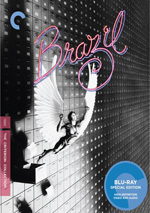 At one point, Universal executives decided to hire some editors to redo it, and this is what they produced, a version of Brazil that focuses on the romantic aspects of the story and provides it with a stereotypical happy ending. This edit of the movie has received virtually universal condemnation, and I agree that it doesn't compare to Gilliam's version. To be frank, it didn't seem that bad to me, but I think that's because I saw it so soon after I'd watched the longer cut. I couldn't fully appreciate the cuts because I mentally filled in what I knew from the definitive version. Anyway, it unquestionably changes the entire tone of the film and is valuable mainly as a historical curiosity; it’s not worthwhile as a movie in its own right. Alongside “Love Conquers All”, we find a commentary from journalist David Morgan. Whereas Gilliam discusses the making of the film and his related thoughts, Morgan essentially summarizes the differences found in this cut. It's too brief - there are quite a few blank spots – but Morgan does a good job of telling us what changed and how it altered the content and messages of the movie. I found this to be very helpful, since I hadn't clearly noticed many of the differences. It's not as much fun as Gilliam's track, but it definitely is worth a listen. Next comes a documentary called What is Brazil?. Produced around the time of the film's 1985 release, it runs 29 minutes, seven seconds and provides a good but rudimentary look at the background and making of the film. It's not a great program, but as promotional pieces go, it's pretty good and it added some interesting information about the movie. Created for the 1996 Criterion laserdisc set, The Battle of Brazil: A Video History comes next. Hosted by film journalist Jack Mathews, it lasts 55 minutes, nine seconds and details the sad and sordid history of the fight that surrounded the release of the movie. All of the key players are present, whether through then-new interviews or via archival audio conversations. Under The Production Notebook, we get a mix of subdomains. “We’re All In it Together: The Brazil Screenwriters” offers 10 minutes, 42 seconds of interviews with co-writers Gilliam, Tom Stoppard, and Charles McKeown. As is the case throughout this set, all participants are frank and upfront about the process through which they went, and these sessions are very interesting. Another interview is presented during the Brazil’s Score section; Gilliam and composer Michael Kamen discuss the music here with some pretty informative comments in nine minutes, 41 seconds of interviews and narration. More video footage can be found during “Fashion and Fascism: James Acheson on Brazil’s Costume Design”. Costume designer Acheson narrates some photos and drawings of the material for the film; the audio/visual part of this section runs for seven minutes, one second and adds some helpful information. We hear more from David Morgan in “Flights of Fantasy: Brazil’s Special Effects”. This goes for nine minutes, 41 seconds and includes Morgan’s commentary as we watch some of the movie’s effects sequences as well as test shots. It becomes another informative program. Morgan does similar duty for the 20-minute, 45-second “Designing Brazil”. He covers props, locations and sets in this enjoyable “visual essay”. “Production Notebook” ends with “Dreams Unfulfilled: Unfilmed Brazil Storyboards“. It presents an introduction and then shows us eight storyboards that’ve been brought to life via animation. These run a total of 21 minutes, 12 seconds and allow us to get a good sense of some unfilmed sequences. In addition to the film’s trailer, we find a 20-page booklet that features an essay from film critic David Sterritt. Though not one of Criterion’s most substantial pieces, it’s still a nice addition. Brazil provides a daring, rich experience that remains gripping after 27 years. Almost certainly Terry Gilliam’s best work, it holds up to repeated viewings and provides an involving flick. The Blu-ray offers good picture and audio along with a strong roster of supplements. Fans will feel pleased with this high-quality release.